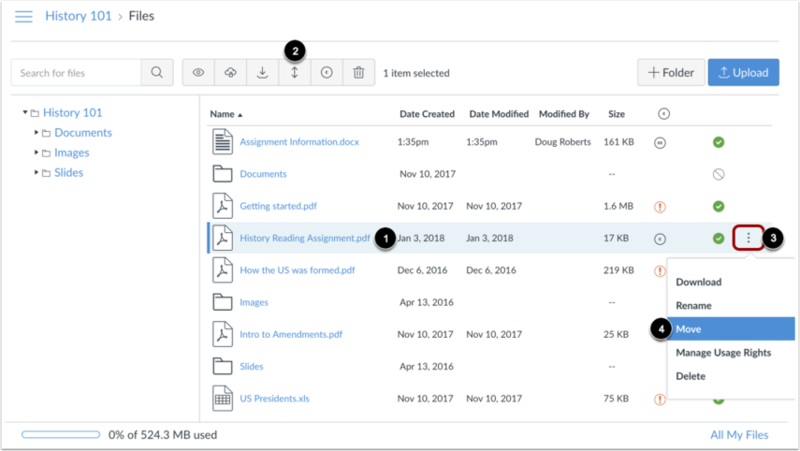 You can move and organize the files in your course by dragging and dropping files or using the Move options for each file. Files are always organized in alphabetical order, so you are not able to rearrange the organizational structure of files, but to locate a file you can always sort files by column. Locate the file you want to move. Click the line item for the file . To move the file via the toolbar, click the Move button . To move the file via file settings, click the Options icon , then click the Move link . Select the folder where you want to move the file  and click the Move button . You can also manage your files using a basic click-and-drag method. Click the file name and drag the file to the desired folder. Once you see the folder highlighted, release your mouse. The file has been moved. 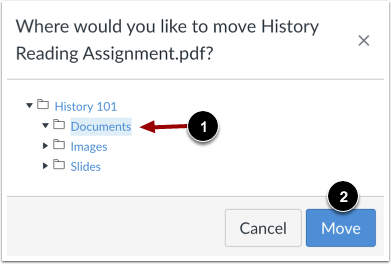 Note: Instructors can drag and drop files from their personal files into course files. You can also move a file from the right pane to the left pane. To select multiple files, press the command key (Mac) or the control key (Windows) while clicking the line of each file you want to select. To select all files, press the command + A keys (Mac) or the control + A keys (Windows). 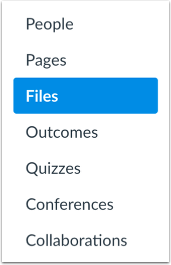 To select a range of files click the first file you want to select, hold down the Shift key, and then click the last file you want to select. All files between the first and the last file will be selected. Note: You can also use the same key command to deselect a file. Previous Topic:How do I use Files as an instructor? Next Topic:How do I rename a file as an instructor? Table of Contents > Files > How do I move and organize my files as an instructor?